With the Tokyo Motor Show happening in less than a month, it’s no real shock that Lexus’ presence at the Frankfurt Auto Show was more than little subdued. 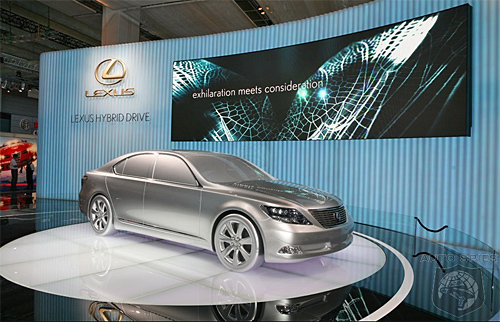 The extent of their attendence seemed limited to only to a plastic molding of the LS 600h, pictured above, and the debut of the new GS refresh. Hardly newsworthy when compared with the likes of the BMW X6, the Porsche GT2, or the Mercedes F700, and rightfully so. This was not Lexus’ time to shine. The only other Lexus news that has emerged from the show was in regards to the European release of the IS-F. According to Dutch auto-site AutoTeleraaf, the automaker, feeling overshadowed by the BMW M3 and Mercedes C63 AMG, has bumped the release date to spring 2008, though in all honesty it reeks of sensationalism. To know that the date had been bumped would requiring knowing when the original release was expected, and Lexus doesn’t strike me as a company that could be scorned into action. As to what we can expect from the Tokyo Motor Show, it’s anyone’s guess, but it’s all but guaranteed to be bigger and better than what we saw this week.